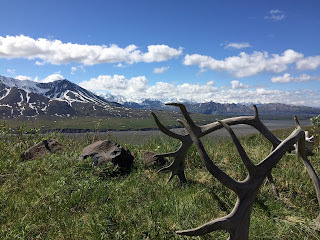 A few more photos and stories from Denali National Park. 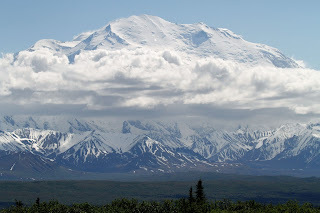 First of all, you need to know that Connie was here in 1975 with her family and regales us with stories of seeing Mount McKinley etc etc. 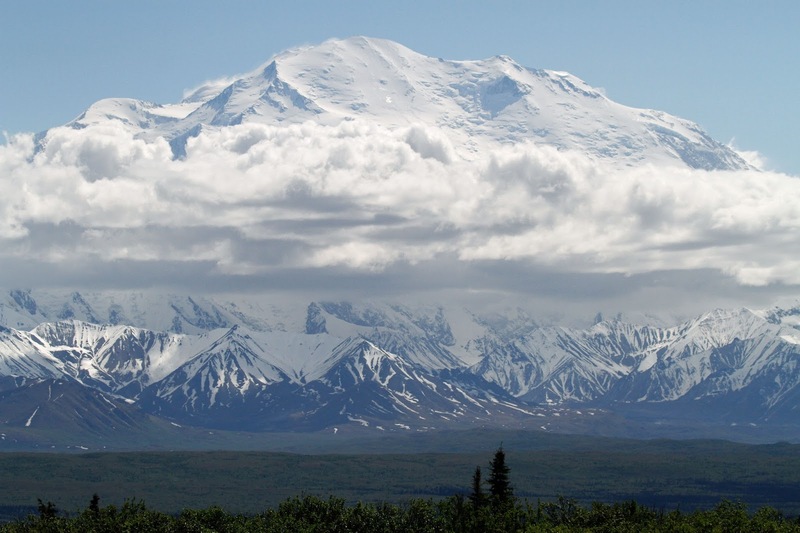 Secondly, you need to know that President Obama officially renamed America's tallest mountain to Denali to reflect the native Alaskan term meaning "Great One". Words don't do this mountain justice. I've seen photos but those do not compare to seeing the mountain in person. 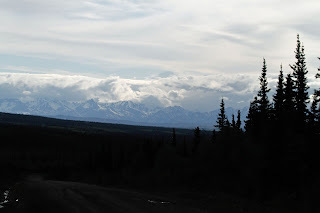 We caught our first glimpse of the mountain while driving the Denali highway. Look closely above the clouds. That is the mountain peak. We caught other partial views on our first bus trip through the park and through the clouds and rain. Look through the clouds - that's snow on the mountain. Driving through the park is a whole other story but this is a sample of the view along the road. Denali is out there somewhere. We stopped at the Visitor Center in the middle of the park. 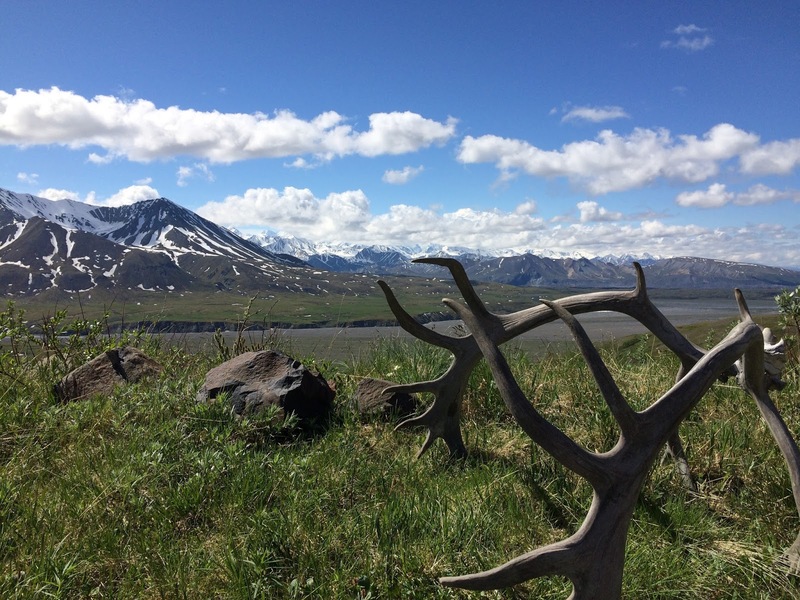 They have Caribou antlers laying around so I tried to get artsy. Again, the mountain is shown just peaking out above the clouds. We were pretty happy that we saw parts of the mountain but on our second day, the weather broke and we got to see Denali's true awesomeness. Its hard to understand how big 20,310 feet is until you see it directly compared to the other mountain peaks just in front of it. Those brown things with snow on top are actual mountains. Denali towers above the cloud layer and dwarfs the other mountains. Our bus driver Wendy was terrific. Even though she's been driving that bus for 17 years, she still stopped at every turn and let us all take photos. She understands how lucky she is to have this mountain as her daily backdrop everyday in summer. She told us that the mountain is only visible 30 % of the time and that we were lucky to have this view. The bus ride was 92 miles each way. 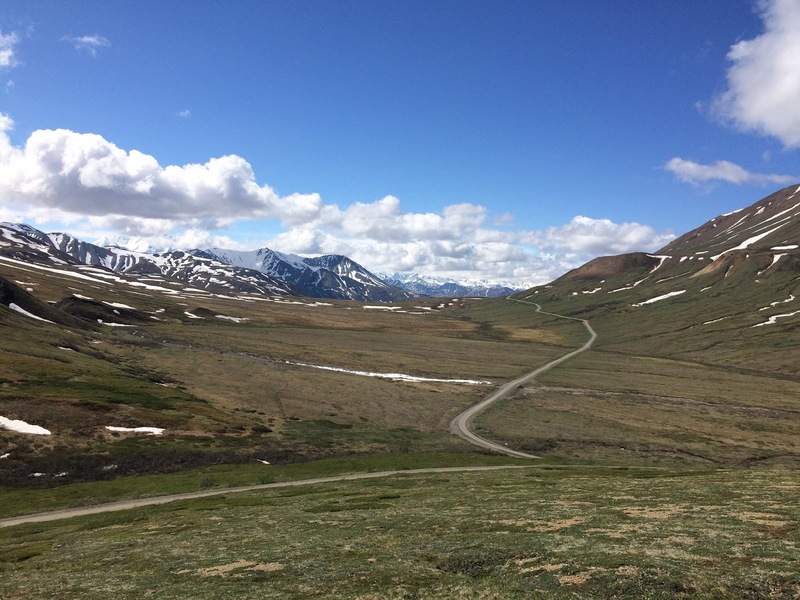 With all of the stops for bears and caribou and birds and the mountain, it took us 13 hours to get back to the starting point. On our way back, the mountain took on another form appearing as a watercolor above the landscape. This photo is not Photoshopped. This is just how it appeared in the evening light. Wow. 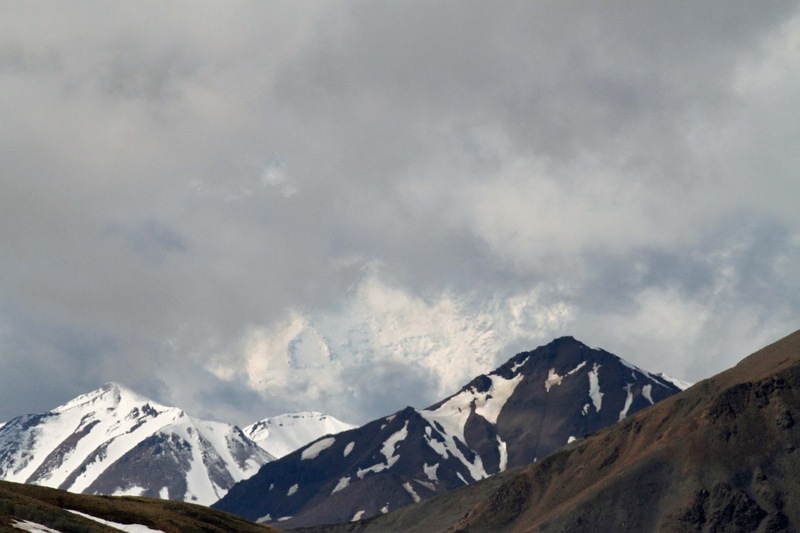 Consider this, Denali is so tall that it is visible from Anchorage 250 miles away. You should go see it.